Tip: When viewing a conversation, you can automatically quote text in a reply by highlighting the text, then typing r. For more information, see "Using keyboard shortcuts." Use `git status` to list all new or modified files that haven't yet been committed. For more information, see "Creating and highlighting code blocks." You can create an inline link by wrapping link text in brackets [ ], and then wrapping the URL in parentheses ( ). You can also use the keyboard shortcut command + k to create a link. This site was built using [GitHub Pages](https://pages.github.com/). Tip: GitHub Enterprise automatically creates links when valid URLs are written in a comment. For more information, see "Autolinked references and URLS." To order your list, precede each line with a number. You can create a nested list by indenting one or more list items below another item. To create a nested list using the web editor on GitHub Enterprise or a text editor that uses a monospaced font, like Atom, you can align your list visually. Type space characters in front of your nested list item, until the list marker character (- or *) lies directly below the first character of the text in the item above it. To create a nested list in the comment editor on GitHub Enterprise, which doesn't use a monospaced font, you can look at the list item immediately above the nested list and count the number of characters that appear before the content of the item. Then type that number of space characters in front of the nested list item. In this example, you could add a nested list item under the list item 100. First list item by indenting the nested list item a minimum of five spaces, since there are five characters (100.) before First list item. You can create multiple levels of nested lists using the same method. For example, because the first nested list item has seven spaces (␣␣␣␣␣-␣) before the nested list content First nested list item, you would need to indent the second nested list item by seven spaces. 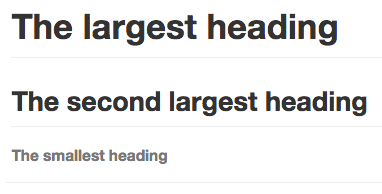 For more examples, see the GitHub Flavored Markdown Spec. To create a task list, preface list items with [ ]. To mark a task as complete, use [x]. For more information, see "About task lists." You can mention a person or team on GitHub Enterprise by typing @ plus their username or team name. This will trigger a notification and bring their attention to the conversation. People will also receive a notification if you edit a comment to mention their username or team name. @github/support What do you think about these updates? Typing an @ symbol will bring up a list of people or teams on a project. The list filters as you type, so once you find the name of the person or team you are looking for, you can use the arrow keys to select it and press either tab or enter to complete the name. For teams, enter the @organization/team-name and all members of that team will get subscribed to the conversation. The autocomplete results are restricted to repository collaborators and any other participants on the thread. You can bring up a list of suggested issues and pull requests within the repository by typing #. Type the issue or pull request number or title to filter the list, and then press either tab or enter to complete the highlighted result. For more information, see "Autolinked references and URLs." You can add emoji to your writing by typing :EMOJICODE:. Typing : will bring up a list of suggested emoji. The list will filter as you type, so once you find the emoji you're looking for, press Tab or Enter to complete the highlighted result. For a full list of available emoji and codes, check out emoji-cheat-sheet.com. You can tell GitHub Enterprise to ignore (or escape) Markdown formatting by using \ before the Markdown character. Let's rename \*our-new-project\* to \*our-old-project\*. For more information, see Daring Fireball's "Markdown Syntax." "About writing and formatting on GitHub"